When Dr Holly Barclay first worked with fellow conservationists and researchers in the beautiful and lush forests of Sabah, she knew Malaysia was a place she would ultimately return to in the future. Three years later, Dr Barclay is now a researcher and lecturer based at Monash University Malaysia. “Coming to Malaysia is great because as a conservationist, there are a lot of interesting issues here,” she said. 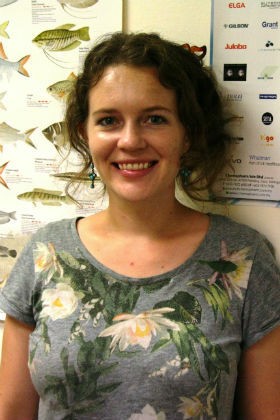 But it’s not the lush rainforests in which she first worked in that have caught her interest; instead, Dr Barclay’s current work in Malaysia is focused on studying how aquatic organisms, specifically small animals such as insect larvae, crustaceans and mollusks, respond to environmental changes in oil palm plantations. “I study freshwater systems inside oil palm plantations and my background is mainly in zoology and ecology. I look at how the changes in the environment in an oil palm plantation affects animals living in streams and rivers,” said Dr Barclay. She said that oil palm was one of the world’s most rapidly expanding crops - over 5 million hectares of land are now used to grow oil palm in Malaysia. While our government has put in certain limitations to the expansion of plantations as part of the effort to minimise the environmental impact of the plantations, there is a growing need to monitor and mitigate the negative impact of oil palm cultivation within plantations. “To know how to effectively implement sustainable management methods, we need to know how management of plantations affects water quality and aquatic biodiversity within oil palm waterways, and then use this information to help managers minimise these impacts,” said Dr Barclay. She said her research could also be used to determine how to monitor changes happening within an oil palm plantation, using the presence of different kinds of animals and species. “One of the reasons I chose to do my research on this is because there is very little that is known about all the different species’ of invertebrates found in these oil palm plantation streams. “The tropics is just so biodiverse, that there are a lot of species we haven’t looked at yet,” she said. Working out in the field is one of the highlights of her work, and she shares what a day of field work is like at an oil palm plantation in Selangor. “After we arrive at the plantation, we’ll decide where to take samples, based on several factors. Once we decide, we’ll make a visual assessment of the area, and then proceed to take our samples using nets,” she explained. The samples are then processed in the lab. Dr Barclay said she hopes to be able to share her passion for conservation with her students, starting off with an inter-disciplinary course called “Sustainable Planet” which is being introduced as a summer course this year. “Having a view on the conservation effort in our world today can certainly be an advantage for any student, regardless of their discipline,” said Dr Barclay.